I have spots on my stainless steel frying pan that I can't wash off and would like to know if it's safe to use this frying pan? This photo shows the type of steel and brand of the frying pan. If anything is leeching, it would be stuff leeching onto your frying pan, not the other way around. 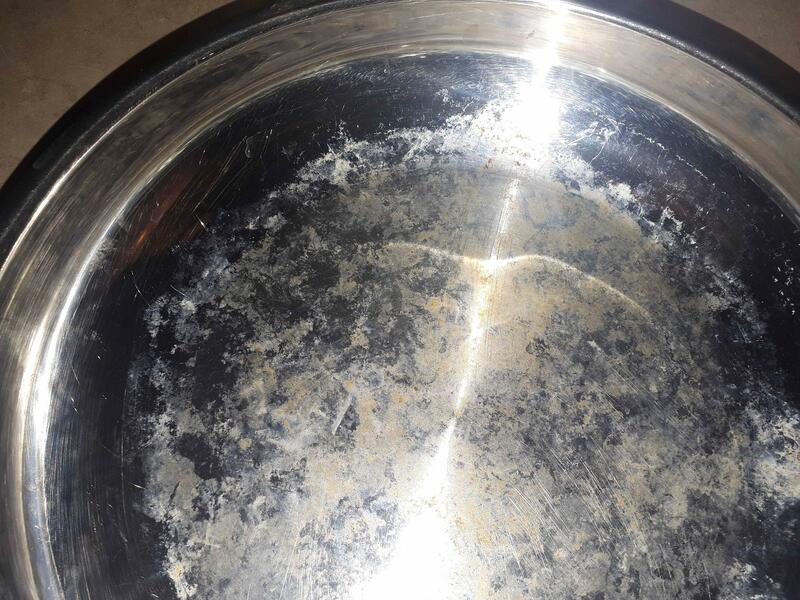 It looks like the spots on the inside bottom of your pan are hard water deposits, maybe combined with residue from food cooked in the pan. 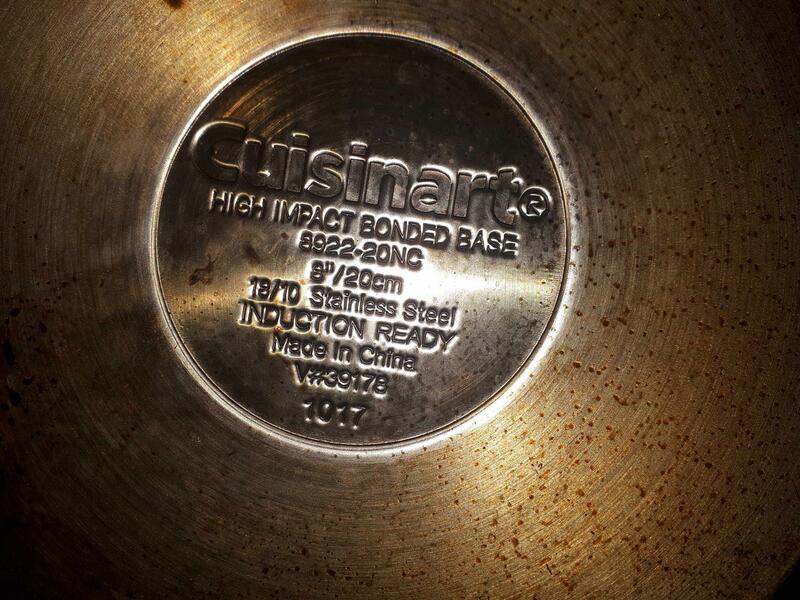 Yes, at least in the photo it does have kind of a brownish tint to it, but I don't think it is rust, as stainless steel isn't normally supposed to rust, and the Cuisinart brand has a reputation to maintain. Real stainless steel doesn't leach metal into your food either. I get a lot of this kind of staining on the insides of my stainless steel pots, especially with boiling beans, for some reason. I think the stains came from cooking activities in the pan, so the they won't poison you if you leave them on. But if they bother you, you can probably scrub them off. I followed the advice of someone on this site about using "Barkeeper's Friend", and it cleans that stuff off great (not Comet, not Ajax, not other abrasive household scrubbing cleanser, but "Barkeeper's Friend." It supposedly has oxalic acid in it, and it dissolves that stuff away with minimal elbow grease. Give it a try,... as they say, test it out on a tiny inconspicuous area first, just to be safe. Not the answer you're looking for? Browse other questions tagged pan frying-pan or ask your own question. Do I need to season a stainless steel saute pan? Stainless Steel Pan — gray bottom. Why? Does “build up” on the bottom of copper-bottom stainless sauce and frying pans matter?